‘CHECK IN’ IS NOW OPEN AS TICKETS GO ON SALE FOR BENIDORM LIVE! LIVE ON STAGE AT SUNDERLAND EMPIRE IN 2019! Derren Litten's smash hit ITV comedy Benidorm is set to bring sunshine and smiles to the UK and Ireland as the first ever stage version of the ITV comedy today announces an extension into 2019 after scorching sales for 2018’s sun-baked dates. Benidorm Live already has audiences across the country rushing to book their tickets for one of the year’s most anticipated theatre events, and they have confirms dates at Sunderland Empire, Monday 14th – Saturday 19th January 2019. The show is produced for the stage by Michael Harrison and David Ian. 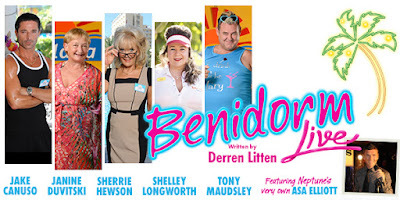 Benidorm – Live will be the stage debut production of the hugely popular TV show, and on making its transfer, writer Derren Litten said: “I am blown away by the reaction to the Benidorm Live tour and so thrilled that we will be visiting more cities so even more people can enjoy the madness I’ve prepared! This is like an exclusive, extended live action episode of Benidorm you can only see if you come to the theatre, it’s also the nearest you’ll get to going on holiday with the cast! When theatres were first asking what kind of show this would be I struggled to tell producers Michael Harrison and David Ian, mainly because I didn’t know myself. Now I have written the show, well, I'm still not sure how to describe it, is it a musical? Not really. Do the cast sing? Yes they do! Is it a play? Yes of course but the audience are also involved in the performance! I’m not really into self-congratulation but I have to say this is the most hilarious, outrageous Benidorm script I have ever written. And now it’s going to be handed over to director Ed Curtis and our amazing cast who I know are going to make it even better. We’ve waited a long time to do this show but the time is definitely right. I declined offers a few years ago to do the show in arenas because I don’t think huge, cold, draughty spaces the size of aircraft hangers are particularly conducive to comedy - why would people want to leave their homes to watch Benidorm on a screen? My only regret is, as an actor, is I didn’t write a part or myself. Maybe I should put myself forward as an understudy? I think I’d make a great Joyce Temple-Savage. I’ve written a book called The Benidorm Diaries which will be on sale in the theatres during the tour, it’s basically the story of how I came to write the show and stories of the crazy things that happened day to day while filming in Spain; maybe I’ll turn up at some of the venues and sign a few copies for the fans? That might be a more respectable way to join the gang on tour rather than hiding in one of Sherrie Hewson’s suitcases."